The Site is comprised of various documents and web pages created and maintained by Direct Energy. While accessing and using the Site, you may be able to order services or pay bills on line or conduct other business with Direct Energy through the Site (the "Services"). The Site and the Services are offered to you on the condition that you accept, without modification, the terms and conditions contained in this document. Your use of the Site and any Services constitutes your agreement to all such terms and conditions. The terms "Direct Energy" "Company" "we," and "our" are used in this site for purposes of convenience and are intended to refer to Direct Energy and/or its affiliates, subsidiaries or related parties either individually or collectively, as the context may require. These references are not intended to suggest that the various Direct Energy companies referred to are not independent corporate entities having separate corporate identities and management. We know that many visitors to our site are concerned about the information they may provide and how we may use that information. Our Privacy Statement governs the collection, use, retention and disclosure of information we gather from the Site, and is available on the Site. The information provided through the Site is intended solely for the general knowledge of visitors to the Site and does not constitute an offer or a solicitation of an offer for the purchase or sale of any shares or other securities of Direct Energy. The information contained in this Web Site does not constitute advice or an offer to sell or deal in any securities and must not be relied upon in connection with any investment decision. Although Direct Energy makes reasonable efforts to ensure that the information provided through the Site is current and accurate, Direct Energy makes no representations or warranties as to the accuracy, reliability, completeness or timeliness of such information. All information is provided "as is" without any representation, warranty or condition as to its accuracy or reliability. Certain documents and other materials on the Site, including presentations and documents filed by Direct Energy with regulatory authorities of selected jurisdictions and listed and/or linked to the Site, speak only as of the dates on which such documents and materials were filed or otherwise used by Direct Energy. The contents of such documents or materials may become out-of-date, however, Direct Energy makes no commitment and disclaims any duty to update those documents and materials. The Site and its contents are protected by copyright, trademark and other proprietary rights of Direct Energy or third parties. Direct Energy names and logos, and all related product and service names, design marks and slogans are the trademarks or service marks of Direct Energy. Except as expressly permitted herein, no portion of this web site or its contents, including trademarks, logos and service marks, may be reproduced, displayed or used in any form, or by any means, without prior written permission from Direct Energy or the applicable third party. No other use of the information is authorized. Except as specified above, nothing contained herein shall be construed as conferring by implication, estoppel or otherwise, any license or right under or to any intellectual property right including, without limitation, any patent, trademark, service mark or copyright of Direct Energy or of any third party. Direct Energy and/or any third party owner of such rights retain all such rights. Direct Energy reserves the right to require you to delete, destroy or otherwise remove any content that is used in a manner that in Direct Energy 's sole opinion is contrary or otherwise inappropriate, derogatory or offensive. Any information submitted or communicated to Direct Energy through use of the Site or Services that does not include personal information or data about you is non-confidential and non-proprietary and Direct Energy may, without compensation to you, incorporate, distribute or otherwise use such information for any commercial or non-commercial purpose. Direct Energy is under no obligation to use or post any such information and may remove any information it does post at any time in its sole discretion. Any personal information or data submitted to Direct Energy through use of the Services or Site is governed by the terms of the Privacy Statement. 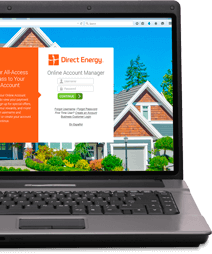 Direct Energy may provide software for download or use on the Site. Any software provided on the Site is protected by copyright law and governed by the terms of the end user license agreement that accompanies such software. You may not install or use any software that is governed by an end user license agreement unless you first agree to the terms of the end user license agreement. The Site contains general information and may contain errors, omissions and inaccuracies. Direct Energy assumes no liability or responsibility for any such errors, omissions or inaccuracies or any other limitation that may arise in relation to the Site. The Site content should not be relied upon for any personal, commercial or financial matters and you should consult an appropriate professional for advice based on your specific circumstances. Direct Energy may make modifications and/or changes to the Site at any time without notice. THE SITE IS PROVIDED "AS IS " AND "AS AVAILABLE" AND IS USED BY YOU STRICTLY AT YOUR SOLE RISK. DIRECT ENERGY MAKES NO REPRESENTATIONS OR WARRANTIES ABOUT THE SUITABILITY, RELIABILITY, AVAILABILITY, TIMELINESS OR ACCURACY OF THE INFORMATION CONTAINED ON THE SITE. ALL SUCH INFORMATION IS PROVIDED WITHOUT WARRANTY, REPRESENTAION OR CONDITION OF ANY KIND, EITHER EXPRESSED OR IMPLIED. DIRECT ENERGY MAKES NO WARRANTIES OR REPRESENTATIONS WITH RESPECT TO ERRORS OR OMISSIONS THAT MAY BE CONTAINED IN THE SITE CONTENT, THE ACCURACY OF THE SITE CONTENT, OR THAT THE SITE CONTENT IS VIRUS-FREE. THE USER ASSUMES ALL RESPONSIBILITY AND RISK FOR THE USE OF THE SITE AND THE INTERNET GENERALLY. DIRECT ENERGY DISCLAIMS ALL CONDITIONS, WARRANTIES, REPRESENTATIONS OR ENDORSEMENTS, EXPRESS OR IMPLIED, WITH REGARD TO THE INFORMATION ACCESSED FROM, OR VIA, THE SITE OR THE INTERNET, INCLUDING, BUT NOT LIMITED TO, ALL IMPLIED CONDITIONS, REPRESENTATIONS OR WARRANTIES OF MERCHANTABILITY, FITNESS FOR A PARTICULAR PURPOSE, OR NONINFRINGEMENT AND ALL WARRANTIES, REPRESENTATIONS AND CONDITIONS IMPLIED BY STATUTE. Some jurisdictions may not allow the exclusion of implied warranties, therefore, some of the above exclusions may not apply to you. DIRECT ENERGY DOES NOT ASSUME ANY LEGAL LIABILITY OR RESPONSIBILITY FOR THE ACCURACY, COMPLETENESS, OR USEFULNESS OF ANY INFORMATION, APPARATUS, PRODUCT OR PROCESS DISCLOSED ON THE SITE OR OTHER INFORMATION ACCESSIBLE FROM THE SITE INCLUDING AVAILABLE FROM ANY LINKS. IN NO EVENT SHALL DIRECT ENERGY BE LIABLE FOR ANY SPECIAL, INDIRECT, PUNITIVE OR CONSEQUENTIAL DAMAGES OR ANY DAMAGES WHATSOEVER RESULTING FROM LOSS OF USE, DATA, REVENUE OR PROFITS, WHETHER RESULTING FROM AN ACTION OF CONTRACT, INTELLECTUAL PROPERTY INFRINGEMENT, NEGLIGENCE OR OTHER TORT OR CLAIM, ARISING OUT OF OR IN CONNECTION WITH THE USE OR RELIANCE UPON THE INFORMATION ON THIS SERVER, SITE OR THE INTERNET GENERALLY. IN ALL OTHER CIRCUMSTANCES, DIRECT ENERGY'S AGGREGATE AND COMPLETE LIABILITY TO YOU OR ANY THIRD PARTY, HOWEVER ARISING, SHALL BE LIMITED TO A MAXIMUM OF $10.00 (USD). The Site may refer to other individuals, companies, entities, organizations, products or services. Such references do not and shall not imply any endorsement or recommendation by Direct Energy of such individuals, companies, entities or organizations or their products or services. The Site may contain links and other references (collectively the "Links") to other web sites. These Links are supplied to you merely as a convenience and the inclusion of any Link does not imply any approval or endorsement or recommendation of that third party or their related information, products or services or any link contained in a Linked site, or any changes or updates to a Linked site. Direct Energy is providing these Links as a convenience, and the inclusion of any link does not imply endorsement by Direct Energy of the site or any association with its operators. Links to this Site may also be provided from other sites either known or unknown to Direct Energy. Access to any other web site linked to or from the Site is at your own risk. Direct Energy has not reviewed and is not responsible for the content of any third party sites linked to or from the Site and does not make any representations regarding the content or accuracy of materials on such third party sites. Access to this web site is governed by all applicable federal, state, provincial and local laws, and, in the case of users resident outside of Canada or the United States, you may also be subject to additional laws of the country where you reside. You are responsible for compliance with the laws of your jurisdiction and other applicable law. This agreement constitutes the entire understanding and agreement between you and Direct Energy with respect to the Site and your use of same.